Even if you discover high levels of radon in your home, it is relatively easy and affordable to have a mitigation system installed. Mitigation systems are best installed by National Radon Proficiency Program (NRPP) certified professionals. Typically, a radon mitigation system involves inserting a pipe into the foundation of your home and exhausting it outdoors 12″ above the roofline. 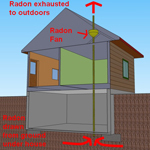 A fan can help create the vacuum to draw the radon from the soil. Once exhausted, the concentration is no longer at dangerous levels. In general, radon mitigation system costs can range from approximately $800-$2500, with the average reduction system costing approximately $1500.